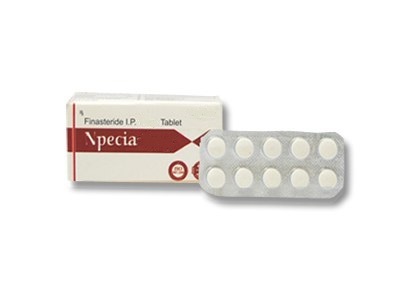 Npecia 5 (Finasteride). Synonyms: Proscar, Proscar, Proskar. A synthetic azasteroid compound with a specific ability to inhibit 5-alpha reductase and the conversion of testosterone to dihydrotestosterone (DHT). The use of Npecia 5 mg can inhibit the growth of the prostate gland, improve urine outflow during hypertrophy of the gland, reduce the symptoms associated with adenoma. A decrease in the content of DHT in the blood is observed 24 hours after taking the drug. With prolonged use there is a decrease in the size of the prostate gland. Take finasteride orally (before or during meals), 0.005 g (5 mg = 1 tablet) 1 time per day. The clinical effect develops quickly in some cases and in a few months in others. Usually the drug is well tolerated. It is necessary, however, to monitor the general condition of the patient, the discharge of urine (in order to avoid its retention). For patients with impaired renal function, a dose reduction may be required. The drug should not take women and children. Avoid ingestion of the drug (including when working on its production) in the body of pregnant women (there is a danger of teratogenic effect – disorders of the development of the genital organs in male fetuses).